Why not get away from from day to day life and visit Ancient Egypt with all it's mysteries. Cleopatra's Gold at Inetbet Casino is one of my all time favourites, I return to it time and time again. The software is powered by Real Time Gaming. 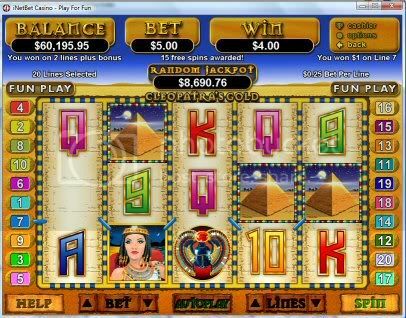 The theme for this slot is Egyptian with the Cleopatra symbol being the wild and the pyramids are the scatters. The symbols include a pyramid, a hieroglyphic, a cat god, the Ankh cross, Horus's eye, and of course Cleopatra. It is a 5 Reel Slot you can play up to an 20 lines at one time, the bet can range from 1 cent to a whopping $5 per line so with all pay lines activated that will be $100 a spin. Get three scatters and you will be awarded with 15 Free games and get 5 Cleopatras and you can win 10,000 coins, a Queen's ransom. The feature may be re-triggered during the free games. The Cleopatra symbol is wild and substitutes for all other symbols except Pyramids, which are the scatters. 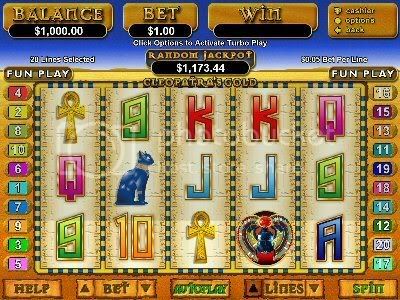 Random Jackpots can be won at the conclusion of any game and the jackpot climbs very rapidly on this slot as it is very popular. You can try out Cleopatra's Gold with $10 no deposit for new players here, and I am sure you will be hooked on it as much as I am.